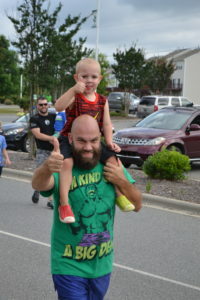 The call went out to all Dads and 2.0s for a Superhero themed F3 Dads event, and 77 of F3 MeCa’s finest Dads and 2.0s answered that call. 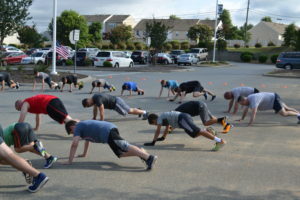 At 0900, YHC broke out the marginally necessary bullhorn and started the festivities with a welcome (especially to any and all FNGs), introduction of YHC and C0-Q Project, and a disclaimer. That out of the way, it was time to get down to some Superhero training. 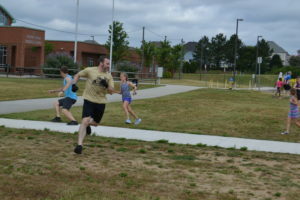 The Thang: – Part 1: Superheros mosey to Harris Rd Middle School and show off their ability to handle relatively long distances (1/3 mile or so – not insignificant.) Group counts off (by Dad) into two groups. 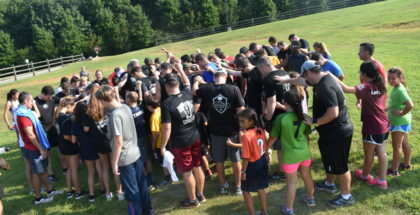 YHC takes one Group behind the Middle School to the track, while Project takes the other group and stays out front by the trailer. Time for the Superheros to work on their agility and quickness. In front of school. Capture the Flag. Two flags per team, each team has half the field as their territory. Opposing team tries to steal flags from opposing territory and return to their half of field. If tagged on opposing team’s side, they must return to their side before returning. If tagged with opposing team’s flag on opposing team’s side, they must drop the flag where they were tagged. Agility and quickness again on display. After a relatively quick game of each, it is time to return to our launch point in front of the school. The superheros demonstrate their ability to handle a relatively long run back. The 2.0s are rather impressive indeed. 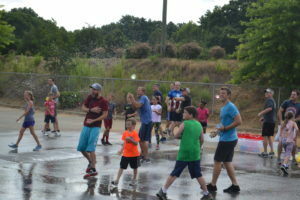 The Thang: – Part 2: The Final Fight…Water Balloon Fight! After a solid 10 minutes of water balloon conflict, both teams exhaust their water balloons. Teams proceed to escalate to picking up bins and trying to dump on opposing players…and teammates. It’s now time to wrap it up. COT: Lengthy Namearama with many 2.0s getting their F3 names. We give thanks for fatherhood and our 2.0s. 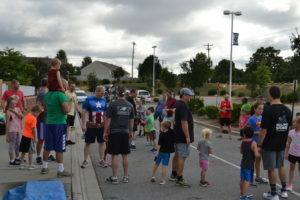 Next F3 Dads event tentatively scheduled at Comanche in July. I hope that everyone had as good a time as my 2.0s and I did, thanks to all for coming out! 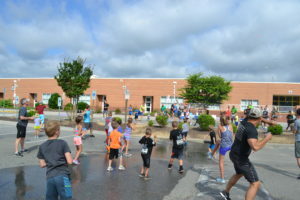 More Tclaps to Project, Whatley, Life Alert, Steel Cannon & Soprano for putting in hours of work to fill the 2500 or so water balloons before the event. Speaking of clean up, thanks to so many of you who hung around and picked up balloons. We got the balloon debris picked up rather quickly, all thanks to the group effort. 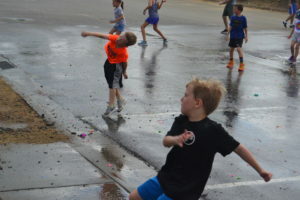 Best practices have been established for putting on a water balloon fight after realizing some aspects worked well, while others not so much. Reach out for advice if you like. I wasn’t going to use the bullhorn, until Zima protested as he made a special trip on Friday to meet Astrovan near uptown to get it, #obligatedtouse. That said, for a large group, it is bordering on mandatory for Namearama, as I can never hear anybody on the other side of a large circle…and this goes doubly for 2.0s. Forgive me for any missing names or mistakes on anyone’s names, some of the audio on my recording was difficult to hear. It is truly an honor and a privilege to be a Dad. If we put ourselves 3rd (with God 1st, and Family 2nd) we will no doubt be the best Dad’s we can be. 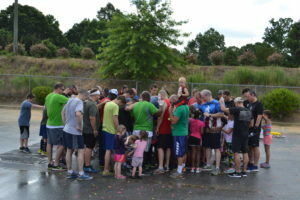 It was an honor to put on this event so that some memories with our 2.0s could be made.